Growing well in part shade Abelia schumannii does not have the glossy foliage as its relatives, however its rosy pink flowers are more attractive. Although promoted as growing well in full sun we believe it does perform a little better with some protection from the hot afternoon sun. Flowers are funnel shaped and fragrant they appear in late spring through summer. Use at the rear of the garden border, as a specimen or as a dividing plant in the border, also useful to grow beneath larger trees. This plant is also promoted as evergreen and semi-deciduous, this simply means that depending how cold the winter is will determine how much foliage Abelia schumannii drops. Warmer climates, colder winters will make a difference. Reaching a height of around 2m with a similar spread, consider that this pretty plant is native to the low mountain forests of Sichuan. It does cope with dry conditions, however at this height things are a little cooler. A humus rich moist well drained soil is best. Can be hard pruned every 4 – 5 years although we recommend removing 1/3 of the canes every year or two once established. This regular pruning of part of the plant is a better approach than most. A good well drained soil is best, dig in some well rotted compost before planting. In heavy soils try to li ghten them for best results. 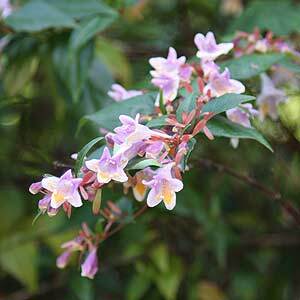 Water Abelia schumannii in with liquid seaweed fertilizer and keep watered during the first summer. Mulch around plants to retain moisture. Position – Full sun to light afternoon shade. Foliage – Mid green on long arching canes. Flowers – Tubular bell shaped. Two toned lilac pink and white.